The Chinese must have gotten to the North Koreans because they're quietly looking for a way to back things down before they're obliterated. 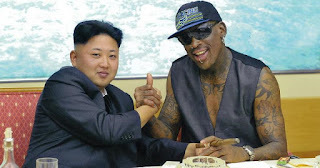 Maybe Dennis Rodman went to Norkland and visited Un and explained to him that the present US Administration isn't made up of posers and pussies? However it went down, the rhetoric is cooling and North Korea is trying another, different approach. The Korean Central Broadcasting Station (KCBS) in Pyongyang reported on 11 May the results of the South Korean presidential election. North Korean propagandists have had difficulty fitting into their communist mindset the impeachment of the South Korean president and her replacement through national elections. The dominant theme is that the people ousted the South Korean president, which they argue, proves that the South Korean system is unpopular. The statements released today stretched the facts in that President Park had many supporters. Her ouster occurred because South Korea follows the rule of law. The demands for her ouster were not unanimous and mattered less than the evidence of her corrupt practices. The significant point about the brief announcement is that it contained no adjectives to describe President Moon. They're hoping that President Moon will make concessions to them. During his presidential campaign, Moon said he intended to handle relations with North Korea and that of the US THAAD System's deployment in South Korea differently than his predecessor did. The Chinese are strongly opposed to the THAAD deployment. Their leaders sense in President Moon an opportunity to reverse or modify the decision to deploy THAAD. They will try to exploit it. A group of senior leaders from southern Yemen, led by a former governor of Aden Province, announced that they are launching a formal movement for South Yemen to secede. In a televised address on 11 May, Aidaroos al-Zubaidi, recently removed governor of Aden Province, announced that he and his cohorts formed a transitional political council to govern southern Yemeni provinces. The pro-secession transitional council consists of 26 southern members, mainly governors, prominent secessionist figures and tribal leaders. Zubaidi said the new council would continue to cooperate with the coalition and foreign powers to combat Iranian influence and terrorism. This announcement is a manifestation of an underlying dispute between Saudi Arabia and the United Arab Emirates over the conduct of the war. In April, Yemen President Hadi dismissed Zubaidi and a cabinet member who were backed by the United Arab Emirates and by Abu Dhabi. That move sparked large protest demonstrations in Aden in support of southern secession. The South Shall Rise Again? Yemen was divided until 1994 when northern Yemeni forces defeated those of southern Yemen, ending a bloody civil war and unifying the country. The southerners have never forgotten that and have rankled under discriminatory policies and practices implemented by northern governments in Sana’a. Secession would leave the Iranian proxy Houthi government in control in the north and would end the fighting. With this announcement, both the Houthi coalition and the Saudi-led coalition are fractured. This explains the inability of either side to end the civil war. Yemen is now divided among (1) the Houthis; the followers of former president Saleh; (2) the Saudi-backed Hadi government; (3) the southern secessionists and (4) al Qaida in the Arabian Peninsula. There appears no prospect for reconciling these groups. Nothing will be accomplished until the Saudis and Emiratis, who jointly lead the coalition, settle their dispute. On 11 May, Hassan Nasrallah, the leader of Lebanese Hizballah, announced in a televised speech that Hizballah was dismantling its military positions on the border with Syria, withdrawing its forces from the border and returning border security responsibilities to the Lebanese Army. "Along the eastern Lebanese border there is no longer a need for our presence, so now we have dismantled and will dismantle our remaining military positions. The mission has been accomplished ... from now on this area is the responsibility of the state," Nasrallah said. Concerning Syria, Nasrallah said the conflict had reached a "new and critical phase" with insurgents severely weakened, and that Damascus, Moscow, Tehran and Hezbollah were "in more harmony politically and militarily than at any time." The announcement may be a cover story for shifting more Hizballah manpower to Syria. As the Syrian government and allied combat forces have recaptured territory, the need for manpower to stabilize and consolidate newly “liberated” territories has increased. Iran sees the instability in Syria as an opportunity, as do so many other regional and international players. On 10 May, one protestor was killed and dozens of people were injured during violent clashes in Caracas. The protestors were demanding new presidential elections. National guardsmen used tear gas against the protestors who tried to march to the Supreme Court building. A group of armed pro-government militiamen harassed protesters during the march. Defense Minister Vladimir Padrino Lopez expressed regret for the deaths that had occurred during more than a month of opposition demonstrations, but he said "no lethal weapons have been used" by the government security forces. He said 36 people have been killed, but not by government security forces. The defense minister said the situation in Venezuela had been described as a non-conventional war "because it is part of the United States' script to meddle, but in a different way." He repeated public allegations made by Maduro's government which blames the United States for encouraging and backing the opposition protests in Venezuela. He said it was part of a US plan "to change the way of things, particularly the government when it is not submissive." Demonstrations have been occurring daily for over a month. One person per day is killed in them. There are still no signs of compromise by the government or the opposition. There also are no signs of mutiny or disloyalty in the security forces.